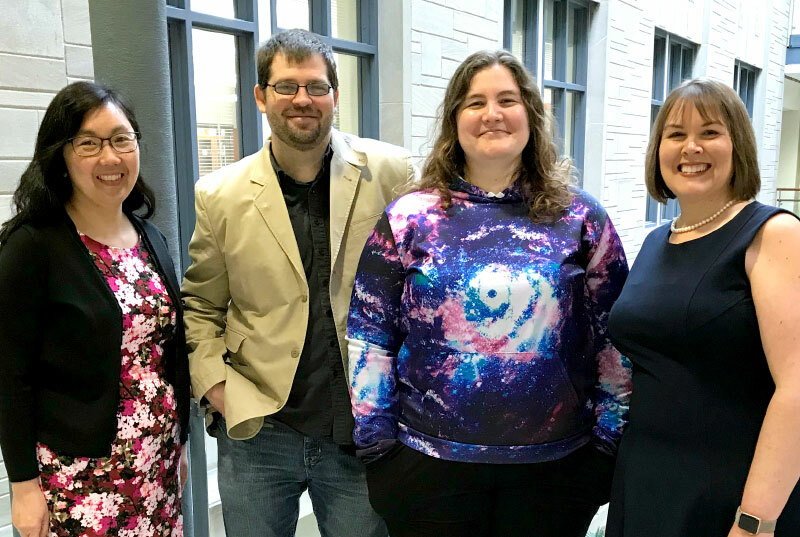 The University of Evansville’s Computers in Science and Math (CiSM) project has been awarded a grant totaling $999,934 to fund scholarships for academically talented students with financial need majoring in biochemistry, biology, chemistry, environmental science, mathematics, physics, or statistics and data science. The project, funded by the National Science Foundation’s (NSF) Scholarships in Science, Technology, Engineering, and Mathematics (S-STEM) program, is led by UE faculty members Joyce Stamm, professor of biology; Angela Reisetter, associate professor of physics; Adam Salminen, associate professor of mathematics; and Sarah Wilson, assistant professor of chemistry. The CiSM scholarships will be available beginning in the fall 2020 semester and will provide up to $10,000 per year for four years to two cohorts of seven or eight students. These students will be part of an interdisciplinary learning community established through an all-expenses paid bridge course during the summer before the freshman year, and maintained as the students live together in UE’s honors residence hall and enroll together in computational problem-solving courses. CiSM students will also receive summer research and conference attendance funds, and CiSM-specific academic advising, career preparation, and mentoring. To develop these skills, the project will introduce a scaffolded curriculum with four interdisciplinary computational problem-solving courses. The first three courses will focus on the power of computational and data visualization skills in the sciences, and introduce students to interesting data-centric scientific projects. The fourth course will be part of the UE ChangeLab program and will pair student and faculty teams with local business or nonprofit clients. Students will work with the clients to solve a problem involving experimental design, data collection, and/or data analysis. Because these courses will be open to all math and science majors at UE, the CiSM project will have impact beyond the scholarship recipients. Data scientists and statisticians work to develop new statistical approaches and develop new software and techniques of analysis. However, scientist in other areas such as genomics, particle physics, and neuroscience need to use these techniques to unravel the massive amounts of data that they collect. Moving forward, scientists will need to have a better understanding of working with large data, and statisticians and mathematicians, with proper training and interest, can help tackle difficult problems throughout the sciences. 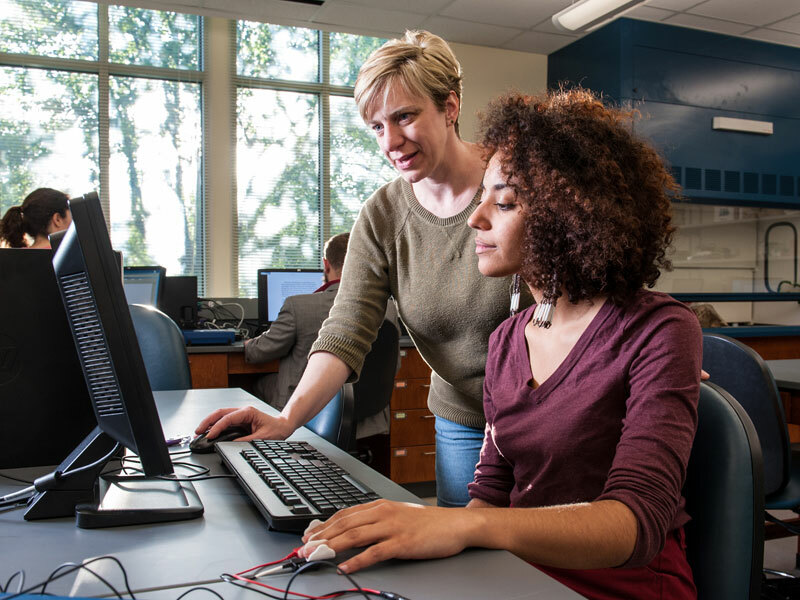 In line with the NSF’s mission to improve STEM undergraduate education, another important goal of the project is to determine the impacts of the learning community on CiSM scholars. Clare Mathes, associate professor of psychology and neuroscience at Baldwin Wallace University, will be the guest speaker for the University of Evansville’s annual Fall Crick Lecture in the Cognitive and Neural Sciences. The lecture is set for September 20 at 4:00 p.m. in Room 100 (Vectren Lecture Hall) in the Koch Center for Engineering and Science. This event is free and open to the public. Mathes will be discussing a rat model of Roux-en-Y gastric bypass surgery and its influence on taste-guided behavior. A behavioral pharmacologist, Mathes’s research focuses on the neurochemistry involved in detecting and enjoying the taste of foods and beverages and how behaviors guided by taste impact eating and body weight status. She uses animal models – primarily rats – to assess these behaviors. Her area of expertise centers around behavior analysis. Mathes earned her PhD in psychobiology from the University of Florida, and held a postdoctoral fellowship at Florida State University. 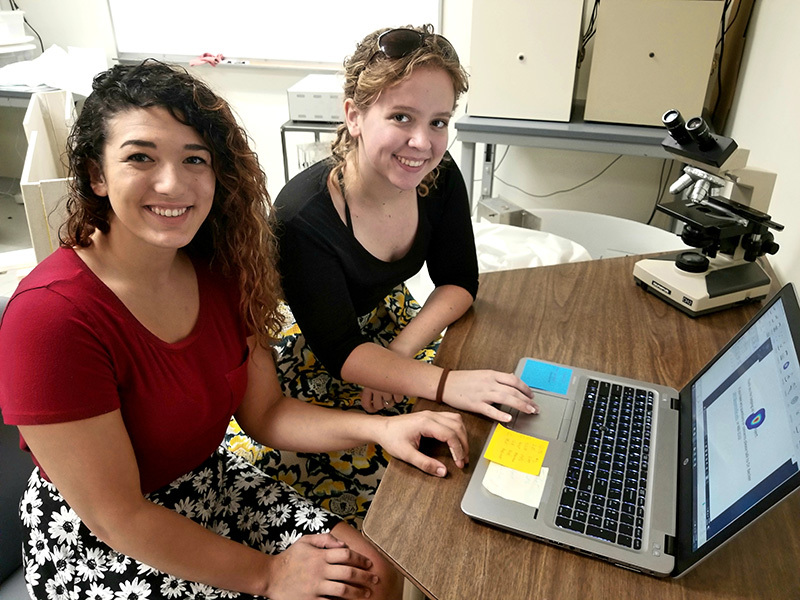 University of Evansville neuroscience students Sarah Dufresne and Brianna Nichols have been selected to present at the Society for Neuroscience meeting in Washington, DC, this November. The two will be presenting the results of their study comparing neuromarketing methodologies. University of Evansville executive vice president for academic affairs Michael Austin will deliver the University’s final Crick Lecture of the 2016-17 school year. His topic will be “A Certain Convocation of Politic Worms: Literature and the Fear of Being Eaten.” The lecture will be April 12 at 4:00 p.m., in Room 100 in the Koch Center for Engineering and Science. All Crick Lectures are free and open to the public and aimed at a general audience. The series is jointly sponsored by the Cognitive Science and Neuroscience programs. In this presentation, Austin will draw on his book Useful Fictions: Evolution, Anxiety, and the Origins of Literature to try to answer the question "why does a species whose survival depends on the ability to collect and use accurate information have a universal predilection for fictional narratives?" The answer takes us far back into humanity’s evolutionary past and deep into a cognitive structure that evolved to help organisms compete for resources in an environment full of dangerous predators and perilous situations. Lora Becker, University of Evansville associate professor of psychology and director of the neuroscience program, has two appearances currently in print in very different sources. The first is titled “Neurobehavioral toxicity of carbon nanotubes in mice: Focus on brain-derived neurotrophic factor messenger RNA and protein” and is co-authored by Babak Gholamine, Isaac Karimi, Amir Salimi, Parisa Mazdaran, and Becker. It appeared in Toxicology and Industrial Health on May 26. This is part of her ongoing collaboration with Isaac Karimi in Iran. The second is an article titled "Why so Angry? The new faces of gender politics" that will appear in the June newsstand version of the national fashion magazine Allure. In this article, Becker explains how micro-expressions are expressed by the nervous system and how they can be used to understand reactionary human feelings. This is a result of a collaboration with Noldus. Lora Becker, associate professor of psychology at the University of Evansville, has earned the October 2015 Volunteer Spotlight by the Honor Society of Phi Kappa Phi. Becker is currently serving as president of the University of Evansville chapter of Phi Kappa Phi. 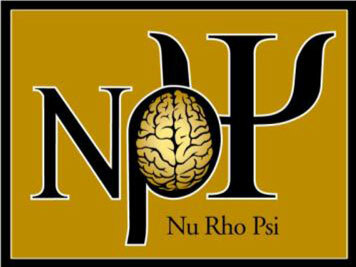 The University of Evansville has received the 29th charter for Nu Rho Psi, the national honor society in neuroscience. An induction ceremony for the Indiana Alpha chapter is scheduled for January 2013. Undergraduate students who want to apply for Nu Rho Psi must have completed at least three semesters of the college curriculum and nine semester hours in neuroscience major courses, be registered as a neuroscience major, and have an overall cumulative GPA of 3.2 and a minimum GPA of 3.5 in neuroscience courses. For questions or to apply, contact Dr. Lora Becker at 812-488-2532, lb47@evansville.edu or stop by her office in Hyde Hall 205.